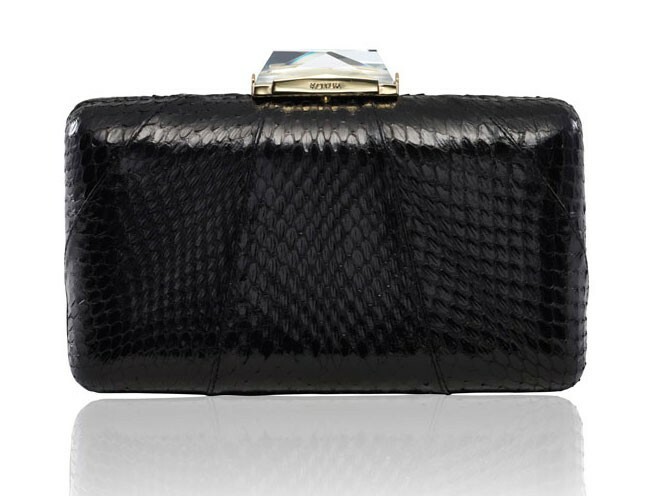 The Espey is a rectangular box clutch wrapped with black snakeskin. With a cut glass clasp, KOTUR's signature brocade lining and featuring a drop-in shoulder chain, this medium-sized minaudiere fits two smartphones plus evening essentials. This item is made of exotic material and is restricted in some countries. Please note that shipping time may vary, to allow for the processing of appropriate customs documentation. Minnie Driver carries KOTUR's Espey Minaudiere to the BAFTA LA TV Tea.